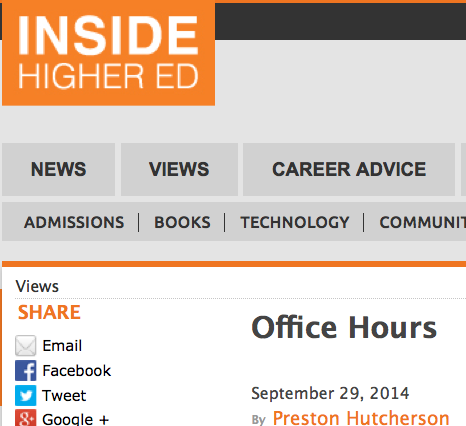 In a poignant essay titled “Office Hours” by Preston Hutcherson, he goes out to seek whether the price of tuition at a private university where he is a student means a better education than that at a nearby community college. The story he tells serves as a tribute to two professors, one at each institution who reached out and made a deep connection. When we talk about student success at community colleges, we often debate how to define it. Is it retention from one semester or year to the next? Is it completing a class? Or is earning a degree or credential the ultimate definition of success? In young Mr. Hutcherson’s essay, he makes the distinction about that kind of success through the connections he made, by sitting down in the offices of each of his professors – one at the expensive private university, and the other at the community college. To him, they each made all the difference between earning a degree… and receiving an education. This is not only a feel-good story about what we do at community colleges, it is a reminder that we, who choose to work and teach here, are committed to offering the best education possible, regardless of what tuition the student pays. This one is really worth the read.